These cookies are nutritious and so delicious. They are full of whole grain oats, nuts, seeds and super foods. 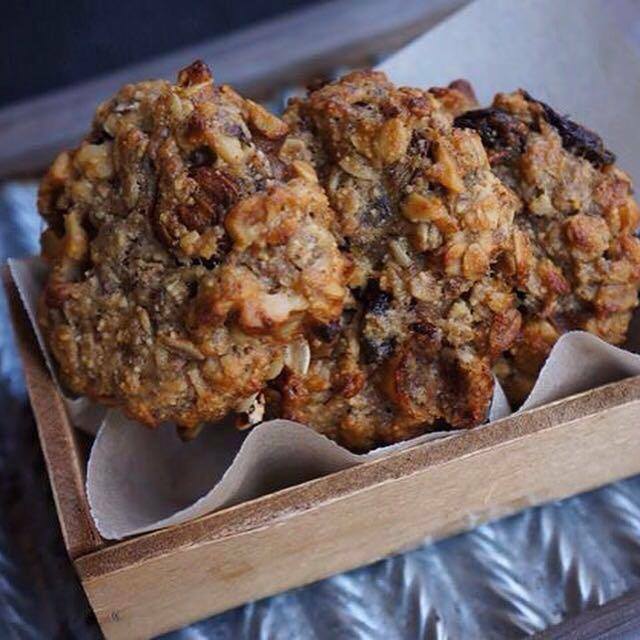 Remember when the banana oat cookie recipes became viral? So many recipes to choose from. I made my share for sure. Some where cakey, some too sweet, some too bananish. These fulfilled my dream to make a wholesome breakfast treat I could enjoy and take on my travels, plus we seem to have ripened bananas every week! Every time I share a recipe, I test it out and lately I have become such a picky pastry Chef, that I only want to share my top recipes that really have high standards which I call master recipes that you can adapt to your own needs and taste. Preheat oven to 325 degrees F. Combine almond butter, coconut oil, vanilla and honey until smooth. Place all other ingredients into a large bowl. Mix with the almond butter mixture until evenly distributed. Shape cookies with a ¼ cup sized scoop onto a cookie sheet lined with a silpat and flatten lightly (cookies won't spread while baking). Bake for about 12- 15 minutes until edges are lightly browned. Let cool 10 mins, then cool on a perforated tray or cooling rack before storing in an air-tight storage container such as a recycled salad container. Simply delicious. Thank you Vanessa for sharing!! where can we find nutritional values on these recipes? Hi Becky I don’t calculate the nutritional values on my recipes only when I am asked by my brands to do this such as when I develop recipes for Bulletproof. The reason being is that it takes a ton of time (and I run my business alone). You can just copy the ingredients and plug them into a nutritional recipe calculator app such as my Fitness Pal or Very Well Fit. Hope that helps. Hey Buddy!, I found this information for you: "BANANA BREAKFAST COOKIES". Here is the website link: https://www.vanessamusi.com/banana-breakfast-cookies/. Thank you.